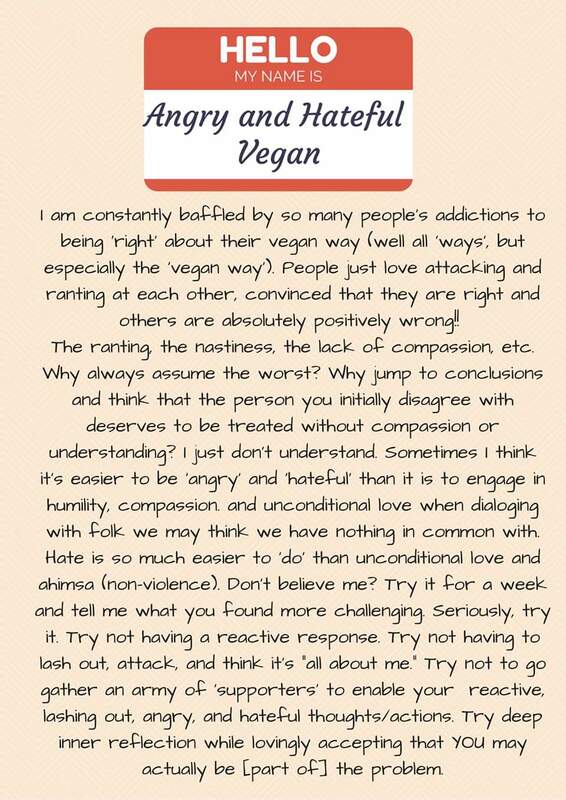 Hello, My Name is Angry and Hateful Vegan and Stop Playing the Race Card! This picture below sums up how I have been feeling about so many vegan sub-group members and how they interact with each other on social media…and beyond. I am not saying it’s all, but there is just so much damn hate and nastiness coming out of sub-groups and within sub-groups. Vegan groups are not exempt– like any other groups of human beings, there are always people who don’t agree with each other, are nasty to each other, etc…. However, I do spend most of my time in vegan spaces on social media, and I can’t help but to point out the hate and anger constantly being spewed. I think what gets me is that after all those hurtful words are thrown, the person doing the bullying has the audacity to be surprised that the person on the receiving end of that anti-ahimsa based communication has no interest in that bully’s hateful vegan way. Wow, Breeze, you just put into words something that I have really been aching about lately. Please, let us all try to show compassion for all creatures (human kind included). This is part of why I’m staying away from Facebook right now. I doubt I’m capable of truly unconditional love, but I do try to hold conversations with respect and civility. Though I don’t put up with much tone-policing when it comes to discussing oppression that affects me personally (queer, trans, or race issues).